These Discount Table Skirts Give Customers the Decorative Touch They Need! Dress up Trade Show Presentations and Banquet Dinner Seating with Quality Covers! 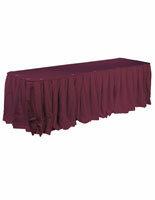 Purchase Attractive Table Skirts in Many Colors Online! Skirting has box pleats for a deluxe style. Table cloth measures 54" x 96" for 6' rectangular tables. (10) clips included for attaching skirting. Ensure the tables at your next banquet or trade show exhibition look great with these table skirts! 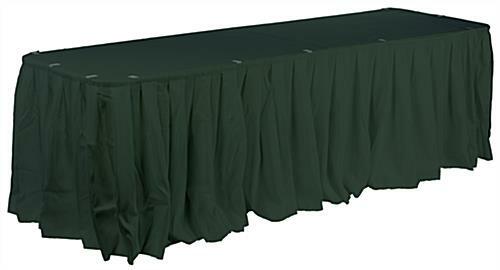 Luxury style and quality construction makes these tablecloths ideal for use at restaurants, banquet halls, and other formal events. These table skirts, called throws or runners, have three components. 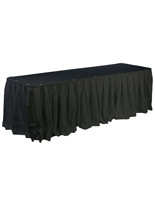 First, is a tablecloth that measures 54" x 96", which is ideal for use with any 6' long table. The tablecloth drapes over each side a little less than half way to the floor, which is why they come with table skirts, too. The table skirting will fit all the way around a 6' rectangular table. Each of the table skirts also includes ten plastic clips that secure it in place. When all the components are set up, they form a throw that covers from top to bottom. The table skirts are made from polyester due to its many advantages over other materials. 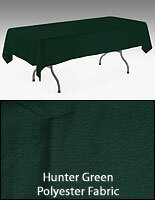 Polyester tablecloths are much less expensive than items manufactured from other fabrics. Even though the table skirts are cheap, they do not sacrifice durability. The linens, table skirts are machine washable and wrinkle resistant. 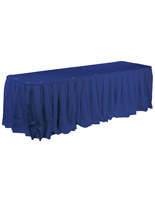 An advantage to buying polyester tablecloths is that they come as complete sets. There are no additional purchases needed to make folding tables look great. A combination of durable fabric, low price, and deluxe style make these table skirts an incredible value!